It has been six months since Rona & I graduated from Pro 1 Chef School. We are both excited to be back in the classroom to learn about ethnic cooking, palette development and food paring in Pro 2 classes. In Pro 1 we learned about techniques and following recipes to the rule, in Pro 2 we are learning how to creatively adjust them. My parents will tell you that I am much better at breaking rules than I am at following them. 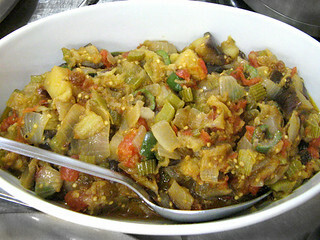 Our teacher, Chef Carol Cotner Thompson calls this “intuitive cooking”. First stop in the ethnic classroom is Italy. 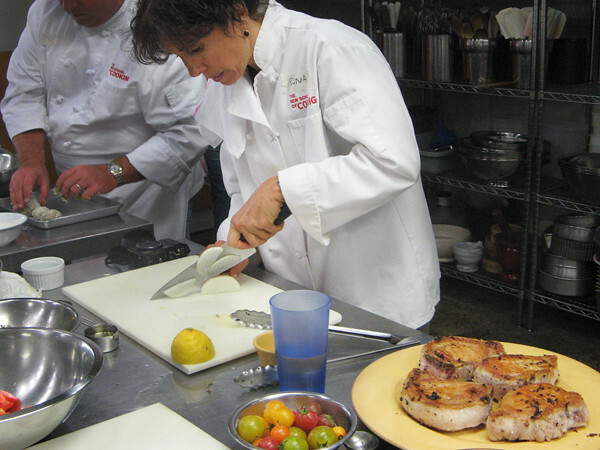 Chef Carol started class with a broad perspective of the twenty regions of Italy. In learning about regional ethnic cuisine, it is good to understand the geography, climates, and historical background. 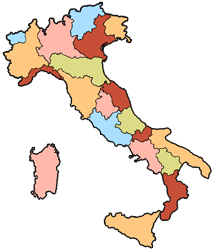 In Italy some regions are landlocked with mountains and lakes, while others benefit from the sea. French and Austrian nuances leave their mark on the northern regions, while the southern regions have a Middle Eastern influence. 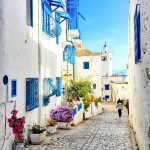 Some regions live under the hot sun, while others have cold winters with a short growing season. All of these diversities make up the richness of the Italian bill of fare. 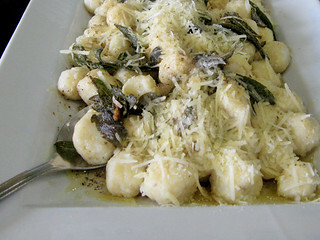 After our whirlwind lesson around Italy, we were able to put our taste buds into action. We tasted sun dried tomatoes, olives, Prosciutto di Parma, and six Italian cheeses as part of our palette development. Chef Carol explains that every time you taste a new food your palate changes. The cheese that wins my heart is the luscious Gorgonzola Dolce (DOP cow cheese from Piemonte, Italy). This decadent creamy blue has a slightly sweet tone. 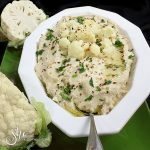 It can be served as an appetizer, a topping on salads or pasta, or a dessert cheese served with fruit. 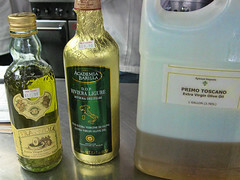 My favorite oil was the Academia Barilla D.O.P Riviera Ligure Extra Virgin Olive Oil . This mild oil has floral undertones with a hint of almonds. I could sip on this while feasting on the Gorgonzola Dolce and be in Italian heaven. 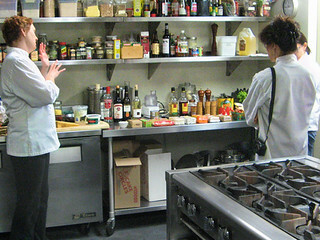 Chef Carol explains the Italian ingredients that we will be cooking with next. 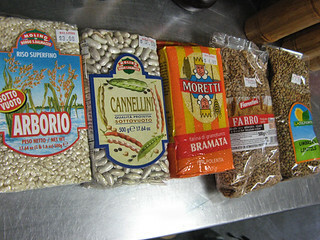 In addition to the oils and cheeses, there are numerous legumes, grains and pasta to explore. Here are a few of the dishes we created. Rona made the most tender Porcini Pork Chops. 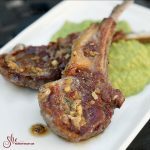 Check out her blog for the recipe. 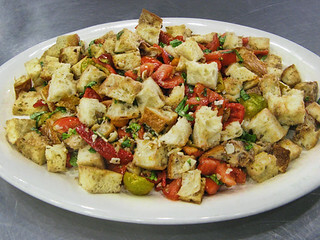 I was assigned to make the Panzanella Salad & Chicken al Mattone, a.k.a. 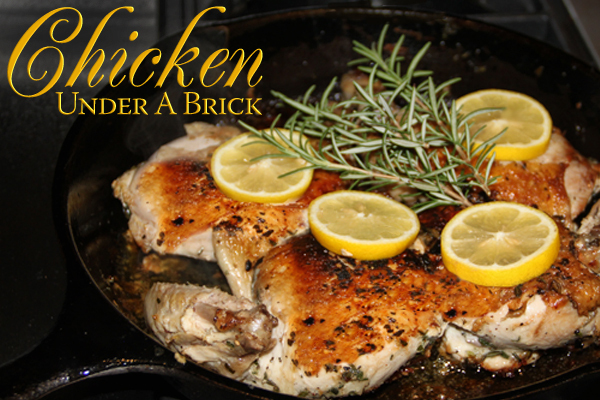 Chicken Under a Brick. Okay, I will not win any plating awards with this chicken photo, but the taste is medal worthy. When I first read the recipe I had to laugh. 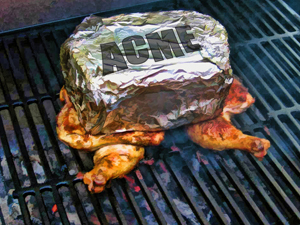 Chicken Under a Brick. 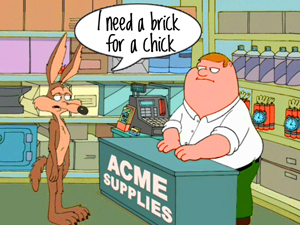 I immediately went back to my childhood cartoon memories and thought about Wile E. Coyote and the ACME company. This is how it played out in my mind. The recipe starts with a beautiful marinade and a butterflied chicken. I personally hate cutting up chicken (insert childhood farm issues here) but I can do it. If you prefer, have your butcher butterfly the chicken. If you want to learn how to do it yourself, click here to watch a video tutorial. Next time I am going to make this on the grill. Weighting the chicken down so the skin makes contact with the hot skillet to ensure it will cook evenly and have crisp skin. The idea is to flatten the chicken by applying weight evenly over its surface, which results in quickly cooked chicken, with crispy skin. 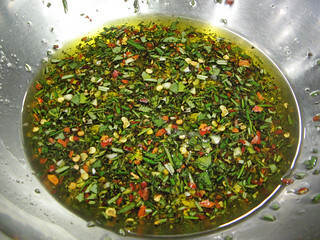 Combine the garlic, thyme, red pepper, rosemary, sage, olive oil, salt & pepper. 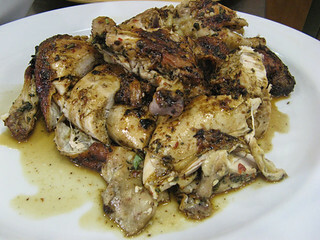 Marinate the butterflied chicken overnight in the refrigerator or at room temperature for 30 minutes. In a 12 inch skillet, heat a little olive oil over medium high heat. Place the chicken skin side down in the skillet. 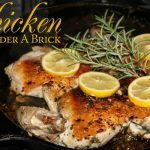 Put another skillet over the chicken or a brick wrapped in aluminum foil to weigh it down. Cook over medium high heat until the skin is golden brown, about 12 minutes. 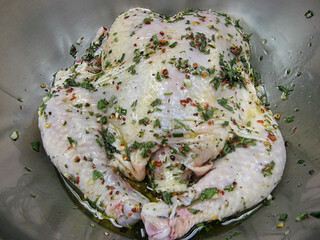 Remove the weight and turn the chicken over, season generously with salt and pepper, and replace the weight. Cook another 12 minutes. Test for doneness. Add lemon juice and serve the pan sauce over the chicken. 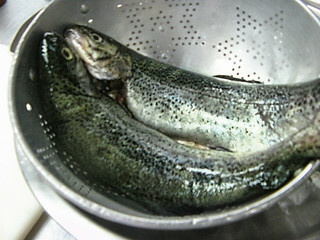 Serve hot or at room temperature, with lemon wedges. Here are two Italian phrases that will get you a long way in my house. 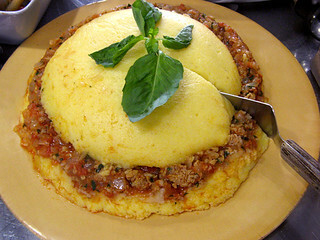 “The trouble with eating Italian food is that five or six days later you’re hungry again.” – George Miller. 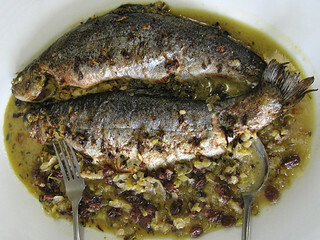 I hope you are as inspired by Italian food as I am. There is so much to learn and eat. …and then she paused for thought. Hope you have enjoyed our adventure in the culinary classroom. 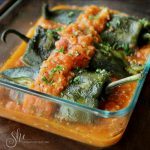 Join us each week as we continue learning new culinary skills. Next week is French food. 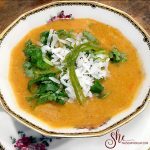 You can also read about Rona’s experience on her blog or What’s Cookin online magazine. CATH… You’re having too much fun in the kitchen! Did Wile E. Coyote show up? Everything looks yum… I’m waiting for your restaurant to open!!! Rona that is hilarious! You gotta love Italians. Wow, everything looks so good. I love the part about learning how to break the rules! I’m also interested in how one develops the palette. I’d love to do that kind of comparison tasting. What a treat! Keep up the great work and thanks for sharing your explorations. PS. Where does the chef shop to find these goodies? Thanks Nan. As I understand it, the best way to develop your palate is to eat as many new foods/food combinations as you can. Be adventurous and keep trying things that you thought you didn’t like. Here is an interesting article on “Top 10 Ways to Improve Your Palate”. If you live in LA and are looking for Italian products to purchase, here are two that were mentioned in class. This looks realy good Cathy. 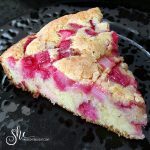 I want to try this one :)) Love your blog. Thanks April. You will love this chicken. Chicken isn’t my favorite thing to eat on the planet, so for me to say that, you know I had to be impressed with the recipe. Gorgeous! Wow! I can’t decide which photo looks more mouth watering but I hear my tummy growling. 🙂 that trout, wow. I’m so going to do your brick chicken. It sounds so right! Thanks Leslie! They both were very good. 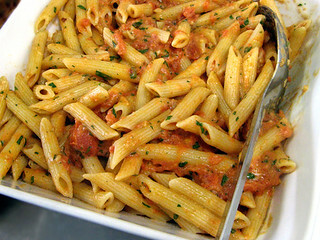 How can you go wrong with Italian food? !